On the afternoon of Friday, June 8 1990, I left Pittsburgh for Columbus, Ohio to catch the Independence Limited bound for the 1990 NRHS (National Railway Historical Society) Convention in St. Louis. Other than a massive traffic jam on I70 near Cambridge, Ohio (which took some fancy maneuvering to leave the interstate and go around) the trip was uneventful and I arrived at my hotel well ahead of the torrential thunderstorms that soon developed. The next morning my friend and I were in the lobby and checked out at 7:15. We boarded the shuttle bus and were soon transported to the departure point, the State Fair grounds. The train was still in the yards, so boarding was not immediate. The only problem with that was that another set of torrential thunderstorms came through while we were waiting and we got semi-soaked (I had brought an umbrella). The train backed up to us about 8:10 and we boarded. 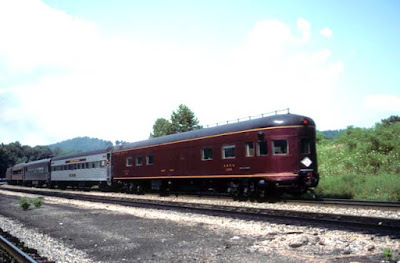 Since we were going first class we had the five rearmost cars to choose from (from the rear) the Mardis Gras (Roanke NRHS's ex-IC round end obs), the New River Valley (a lounge car), an unnamed dome car in UP colors, Pocahantas (an 11dbr sleeper), and Yadkin River (a 10-6). Not wanting to sit in a sleeping car room, remembering that dome cars have a tendency to run hot, and observing the smoking allowed policy in the New River Valley, we chose seats at a table in the Mardis Gras and tried to dry off. The rest of the train consisted of cars from various organizations leased to Norfolk Southern. There were both open window and a/c cars as well as the Roanoke NRHS's Devils Lake commissary car. The 21 car train was pulled by N&W 1218. The mixture of equipment made for a rather ugly train except for the first set of cars which were all N&W red. The train departed more or less on time and we began our trek towards Portsmouth and eventually Cincinnati (Norwood). We were served a continental breakfast consisting of doughnuts, fruit cocktail and orange juice upon departure. Shortly after leaving Columbus the skies cleared and we had a photo runby (we were to have one photo runby everyday except one). Lunch and afternoon snacks for the first class section of the Independence Limited were prepared by Eric Crane, the pastry chef from the Greenbrier. It was hard to diet on this trip. We arrived late (due mostly to poor dispatching) at Norwood and boarded busses for a Holiday Inn that seems to have been chosen because it was not near to anything (it was at least a 20 minute bus ride on the interstate). After a late dinner, I went to bed quite tired. The next morning, Sunday, we again boarded the buses for the trip to Ludlow yard (the train had been moved there overnight to save us 2+ hours of switching...since I didn't need the mileage, I didn't care). Two NS business cars had joined the train (right behind the unit) reportedly to carry some Toyota people an important shipper on this line. We left the yard late and remained late all of the way to Louisville. Our route was down the Rat Hole and then over to Louisville on a line that goes northwest just north of Danville. This is where the new mileage began for me on the trip. Again we arrived late, boarded buses, went to our hotel (closer to where the train stopped), had dinner, and went to bed. Monday found us repeating the by now familiar routine of waking up early. However, a small group of us were determined that for this particular day we were going to get the rearmost seats in the Mardis Gras so we could get a good view of the track. Instead of boarding the bus we called a taxi and beat everyone there. Only problem was...the train didn't arrive until after everyone else did! (We still got the seats thanks to a Roanoke NRHS person who reserved them for us.) Item: the same people monopolized the same seats during the entire trip (except for the day we beat them to it). We made it a point not to sit in the same place twice because we think this is bad behavior. Apparently others disagree. This was the most interesting day of the trip as we crossed the Ohio once again and headed across southern Indiana to Mt. Vernon, IL. The scenery is rolling hills and the line twists and turns its way across the state. We arrived late (as usual) but this time so late that they had served us dinner on the train. The Mt. Vernon chamber of commerce was providing buses to the motel, but things were so messed up that after standing around for 20 minutes we got a cop to call us a cab. Again late to bed. Tuesday was supposed to be a shorter day, with a scheduled 1:30 arrival at the St. Louis Amtrak station. My new mileage was to end at Belleville, IL but I was in for a surprise. Again we were late. This time there was a reason other than poor dispatching. A rail had broken on the MacArthur bridge (used by the River Cities) and there were 10 freights waiting to cross. They detoured us over the TRRA to the Merchants Bridge (used by the Chicago trains) and into the station. Great mileage. We arrived at 4:15, with plenty of time for my friend and I to catch our flight to Chicago. Why Chicago? Well my friend wanted to pick up his car for use in St. Louis, and at $19 one way, air fare was cheaper than a hotel room in St. Louis. 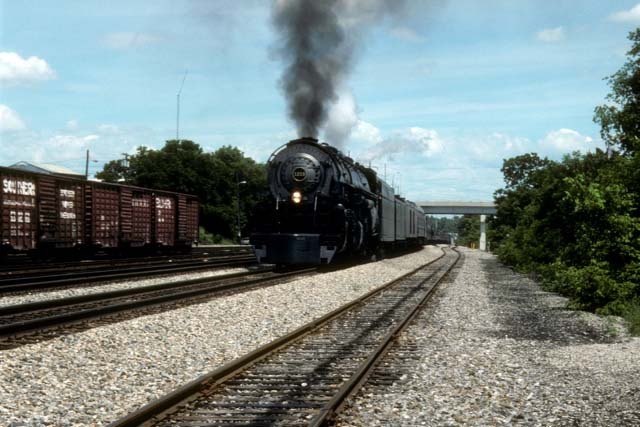 Besides, we could railfan our way down along the SP. The NS excursion consist is showing its age badly. The air conditioning is spotty in the closed window cars, and they just don't look (or smell) nice. The 1218 performed well and we would have been early everywhere the entire trip except for two problems: 1) unlike the usual Independence Limited, the Roanoke NRHS's ground support was a bit shaky. As a result there was usually confusion over how and where to deboard/board the myriad of passengers that were on and off at each of the many stops. These stops stretched to as long as 20 minutes each. This wouldn't have mattered much if it weren't for problem number 2) the Norfolk Southern doesn't seem to care much about keeping the train on schedule. Everyday we were stabbed by freights. Virtually every time, if they had let us go on, we could have kept to schedule without delaying the freight (one day we sat in a siding for over an hour awaiting a freight...we could have easily made it to the next siding without delaying the freight or us). Carl Jensen is not being given the support of the entire railroad. With the departure of Bob Claytor and Jim Bistline (a major stockholder as well as the "soul" of the steam operation) I believe the NS Steam program is doomed. We arrived back in St. Louis on Wednesday afternoon and checked into the Drury Inn at Union Station. This rehabilitated railroad YMCA would be my first choice for a place to stay, with reasonable rates about half of the Hyatt at Union Station. It's located right across the street from St. Louis Car Company's private car tracks at Union Station. The rooms are huge (especially the king rooms), well appointed, and best of all the air-conditioning works well (important in St. Louis in the summer). After registering for the convention we went out to a yard where a friend is rebuilding a ex-Milwaukee Sky Top Lounge. It's going to be a while before that car sees service again. (Update: as of this writing, in 2015, I believe the car is still being restored by another set of owners.) Dinner that night was held at Busch stadium where the Pirates trounced the Cardinals. Actually the Cardinals gave them the game...there were enough errors by the left fielder (scored E8) that we soon had a fleet of diesels big enough to pull a 100 car freight. Thursday found us in the lobby of the Drury having breakfast at 6am. The buses would leave for an undisclosed site at 6:45 and we wanted to be on the first bus. We got out there at 6:20 and the first bus was already full. Nevertheless we got seats where we wanted them. Today's train was over the Alton & Southern and Union Pacific to Findlay, IL. Again, this was all mileage that I needed. There were no trips scheduled Friday, and my friend wanted to go out train watching. I decided to sleep in instead, and spent the day ambling around St. Louis Union Station (a really nice mall--I bought a pair of shorts because of my itching legs), viewing the four steam engines on display (1218, 1522, 844, and 819) and visiting with friends. Saturday, the "get on the first bus" routine found us eating breakfast at 6am and on the bus by 6:25. Again we were transported to an undisclosed location and boarded the train. Today's train would be pulled by 1522, and consisted of some cars of the NS excursion train, some of the UP excursion fleet, and most of the deluxe and first class cars of Thursday's train. Not wanting to chance the A/C in the NS cars, we found ourselves in the UP car "Challenger", a car whose A/C performed well (though all of the cars had trouble with the St. Louis summer heat and humidity). This was a fun trip, almost all of it new mileage for me. The scenery was much more interesting than the Illinois trip of Thursday. 1522 had a bit of trouble with the 21 car train, and used much more water and fuel than expected, necessitating extra stops and delays. There was one (poor) photo runby on the outbound trip to Newburg (actually Bundy Jct. ), and we ended up about two hours late in St. Louis. Sunday we boarded the outbound convention train on the Cotton Belt to Pine Bluff. Again, this was almost all new mileage for me. The train consist included Cotton Belt 819, it's tender, and two baggage/tool cars, a HEP car, two commissary cars, a section of coaches for the NRHS Convention section to Illmo (where passengers would return to St. Louis by bus), a section of coaches going all of the way to Pine Bluff, and two private open platform observation cars. It was a big train for the engine, 22 cars to Illmo and 14 beyond (if my memory serves me correctly). As we boarded the train it was clear that the through section to Pine Bluff was going to be crowded, and that some of the cars had marginal A/C. Some friends and I settled into one that seemed to have the best functioning A/C while others settled into another car that had reportedly worked well on the inbound trip. We left a few minutes later than the 8am advertised departure, and made it to Illmo more or less on time. The scheduled 29 minutes for switching the train and watering didn't come close to being enough time. We were over an hour late out of Illmo with a shortened train. At this point the consist was: 819, it's tender, the two baggage/tool cars, the HEP car, three coaches, the commissary car, a lounge car, two coaches, a dome-obs, and two private cars. By the time we left Illmo the A/C was only functioning well in the lounge and the commissary, and was non-existent in most of the coaches. I should add that it was another 100-/100- day (temperatures in the high 90's and humidity the same). Needless to say we were not amused, especially those of us who almost fainted from dehydration. We continued to lose time due to longer than anticipated water stops (without an auxiliary tender we had to water four or five times on the way to Pine Bluff). Luckily the A/C was partially restored to some of the coaches, but it was still a 5 Diet Coke day for me. Lunch and dinner on this train consisted of sandwiches, chips, and candy bars. There were no photo runbys and in fact we were never officially allowed off the train all the way to Pine Bluff. We arrived at Brinkley, AK, where my new mileage ended, about 2 hours late. We watered and left without losing any more time and were enjoying some of the fastest running of the day (we had a daytime heat speed restriction that kept us to 50 most of the day instead of 70, the track speed for most of the route) when the train came to an abrupt stop. Attempts to reach the engine crew by radio failed. Eventually someone came through and told us that the headlight of the 819 had burned out and that we had to wait while they fixed it. This turned out to be wrong. One of the people in our group was riding in the tool car and came back looking like he had seen a ghost and told us that a steam line had ruptured in the 819, making the most god-awful noise. It turned out that the line to the whistle had broken, spewing steam all over the place. The crew had to abandon the cab and use a clinker hook (or some long rod at least) to manipulate the shutoff valve. Then we had to build up steam and eventually creep to a siding to clear the main line. We could not continue without a whistle and so we waited while two freights that had been following us closely passed us. Finally a northbound freight came along and we took one of its units to lead us into Pine Bluff. 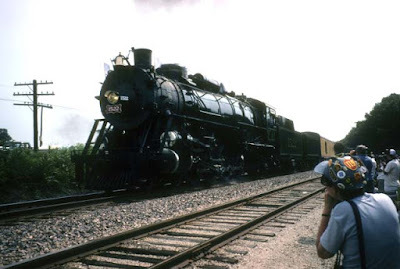 Through all of this, the Southern Pacific (Cotton Belt) was the most professional of the railroads that we saw. The dispatchers were first rate, scheduling meets that delayed all trains minimally. After our accident, most railroads would have "played railroad" for much longer making the switching moves necessary to get us our diesel. With the SP, from the time the northbound arrived to the time the diesel was on our train and we were moving was much less than 30 minutes. From here the trip to Pine Bluff was uneventful except for one plaintiff radio call from the diesel (fittingly a GP9) to the 819: "we're having excessive wheel slip. You'll have to help us some." We arrived in Pine Bluff 5 hours late to the minute at 2:30am. The temperature was still in at least the 80s. Hard mileage indeed. We then drove to Little Rock and checked into an air conditioned Red Roof Inn for what was left of the night. The next morning we woke up with about 4.5 hours sleep and my friend drove me to St. Louis (following the UP much of the way) where it was in the mid-70s and not very humid as opposed to what we endured earlier in the trip, and I caught my return flight to Pittsburgh. There was a clear difference in professionalism between the various railroads which ran these trips. In order of increasing professionalism, I'd rank them: N&W, SR, UP, BN, SP. I've separated the components of NS because there was a noticeable difference (though not a great one). This ordering is very surprising to me because BN has had an anti-steam policy for so long, SP hasn't been that much better, and the NS roads have been doing this for 24 years. But the SP dealt with an excursion train on its rails with little delay to freights (except after our accident) and hardly any delay to the excursion train due to freights. This was not true of the others. In terms of equipment, I'd rank the UP equipment the best by a wide margin, most of the private equipment used for first class and deluxe coach second (the Silver Solarium being an exception), some of the NS equipment third, and everything else (including the bulk of the NS equipment) last. Something has got to be done about this for future excursions to be viable. The people who run steam excursions need to be more realistic in planning for servicing the equipment. On the UP, BN, and SP trips servicing the train consistently took longer than expected. Even ignoring dispatching problems, the running time between stations was often optimistic. On the NS, and SP excursions (the only ones where passengers were taken on at stops along the way) the amount of time allowed for passenger loading was extremely optimistic. I'd rather arrive at 8pm on-time, than 8pm two or more hours late. I'm sure others feel that way, and it certainly would make planning easier. I don't imagine that the Toyota people were impressed with the performance of the NS on the trip from Cincinnati to Louisville. Personally, I find the long delays to water and fuel the steam engines ridiculous. Unless there is some other activity available off train, it is stupid to hold up the passengers for this. If you have to run steam excursions to attract people (as opposed to diesel) run it with steam one way and use a diesel for the return with minimal delay at the outbound destination. 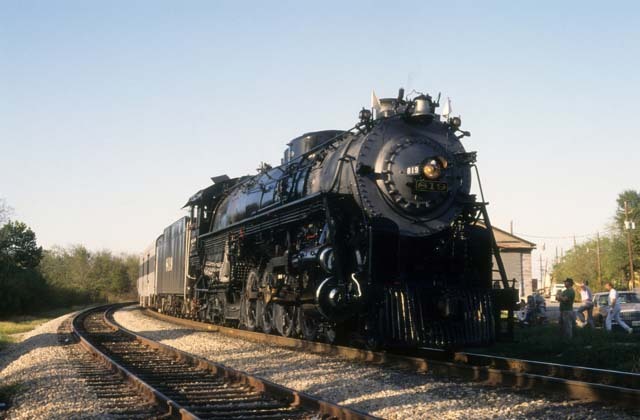 I notice that the NS is doing this on their October 13 and 14th, Richmond to Lynchburg excursions. There was significantly better timekeeping by the airlines than by the railroads. This was mostly a matter of luck I suspect. Next year is the 25th anniversary year of the NS (nee-Southern) Steam program. Carl Jensen is promising special events. Hopefully the NS will support the program through then. I'm happy to be home from such a long trip, but, during the car ride to Little Rock, my friends and I started started discussing coming on a proposed Pine Bluff to Tyler, TX trip in the fall. I guess we're too dumb to give this stuff up. Note: this piece was co-written with the late Peter Putnam Bretz who passed away in May of 2012. It originally appeared in the April 1991 issue of Trains Magazine and is used here with permission of the publisher. It creeps up on you so slowly you don’t notice it until it’s too late. Maybe it starts when you’re a kid and your parents buy you a Lionel train set. Toy trains are neat! One day the family takes a trip by train. Real trains are even neater! Soon you find yourself poring over Amtrak schedules for an old Official Guide. Planning real or imaginary trips becomes a passion. You begin to keep track of where you’ve been, mentally at first, but before long using a written log. The route your train took from Spokane to Sandpoint begins to matter. You buy a railroad atlas and ink in the routes that you’ve traveled. Soon you find yourself daydreaming about being able to ink in more lines. You begin planning and taking trips entirely for the purpose of riding new trackage. Without altogether understanding how, you’ve become a railroad mileage collector. all mileage expires after 20 years—go back and do it again (old-timer mileage). The only countable mileage is steel wheel upon steel rail. Driving an automobile along rails is rubber on steel, hence the mileage is not countable (unless you are in a hi-rail vehicle). This rule would prohibit counting miles obtained riding maglev trains, since no rails touch rails. Obviously, the Committee will have to meet to issue new rules to cover this eventuality. All railways are countable. The San Diego Trolley and the Oil City & Titusville both count, although proper identification may be difficult. Subways, elevated lines, streetcars, and incline railways are countable although many collectors elect not to include them. Roller coasters of wooden construction qualify, but those with metal slide devices on tubular tracks are abominations and do not count. Amusement park railways are acceptable if one can fit aboard and take a ride (this disqualifies both authors from most such lines). Remember a mile is a mile no matter the scale of the conveyance (unless it’s a kilometer, see Rule 4). The method of locomotion does not affect the counting of the mileage. Steam, diesel, it makes no difference. Even mileage obtained while pushing a four-wheel flatbed track car by kicking the ground is countable, as long as the other rules are obeyed. All miles ridden in accordance with the other rules are countable, regardless of other conditions. That is, if you are asleep or in the restroom, the train moves on and the mileage counts. Also, every ride over a line counts. Many mileage collectors elect to keep a separate total of unique miles traveled; this is acceptable. All countable mileage is equal. No track is more countable than others—narrow or broad gauge, rare or commonplace, shiny or rusty, it is all the same. 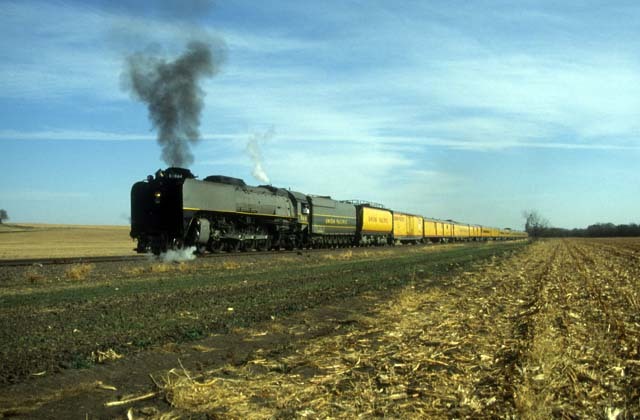 Mileage must be counted consistently—if your home railroads use miles, count all distance in miles, same for kilometers. Concerning gaps in mileage: If the end of the train is at the end of track, you count the full mileage—the length of the train is what counts, not your placement on it. So , if a photo runby is made and the train loads farther along the track from where it stopped, there is no gap in mileage providing the last car has moved no further than the former position of the locomotive. Be careful of mileages used. Amtrak timetables, for example, are very unreliable—the mileage between Los Angeles and New Orleans has been listed as anywhere from 2022 to 2040 miles. Employee timetables are usually a better source, although errors do creep in. In any event, do not rely on mileposts or the conductor for precise mileage information. What about wyes? A wye is only a dot on the map. If you’ve ridden one leg, you have the wye. A collector can categorize mileage in any way he sees fit. That is, do it your way: by railroad traveled over (under present or former name), by Amtrak miles, by miles in private cars, by miles behind steam, whatever. Now that the Rules Committee’s findings have been widely circulated, serious mileage collectors and historians may make adjustments to their lists accordingly. All can be assured that only the correct and proper miles are now being counted. Charles B. Weinstock , of Pittsburgh, Pennsylvania, and Peter Putnam Bretz, of Los Angeles, can be found on various “rare mileage” excursions around the country, although not necessarily at the same time. Neither will divulge his current mileage total. When I attended my first BARGE in 1993 at the Rio I had no idea that I'd be looking forward to the first Saturday in August 22 years later. That year we had a single two table NLH tournament at the Rio and I flew in to Las Vegas on Friday, and probably returned to Pittsburgh the following Monday. I had a blast. So it was with anticipation that I made my reservation at the Golden Nugget on February 3 after receving an offer from them that made the cost less unreasonable. This lead to my first bad beat of the trip...it turns out that reservations made before approximately January 15 were not subject to the dreaded resort fee of $20 + tax. About a month later I made my Southwest reservations to arrive before dinner on Monday, July 27 and return on Sunday morning, August 2. Because I am an old fart I was able to use their Senior fares which in this case saved a few dollars over their "Wanna Getaway" fares and had the added advantage of being fully refundable. On Monday morning I finished packing and Barb drove me down to the CMU campus where the PAT bus service to the airport starts. Pittsburgh buses are free to the CMU community and only take about an hour as opposed to about 35 minutes plus parking time by auto. I usually take it if I am returning home at a decent hour. My flight to Chicago was uneventful. I used the two hour layover to enjoy a Gold Coast Dogs Italian Beef sandwich with giardiniera. A great sandwich but not as good as Mr. Beef's in the city (though much better than Big Al's.) The flight to Las Vegas was also uneventful and on time, arriving at 3:05pm. Here I scored my second bad beat of the trip...Ken Kubey had rented a car and would have been happy to pick me up except that the car barely held him and Rich Strauss and their luggage. So I grabbed a taxi and scored my first good beat the trip...not only did the driver not try to tunnel me, but he insisted on taking Paradise because that was the right way to go. Of course he received a generous tip for his trouble. Over the years, Un, Dan and Sharon Goldman, and I have developed a tradition of having a dinner at Hugo's on the Monday night of BARGE. Usually we were joined by others. This year we were joined by Bree Goldman, Goldie, Warren Sander, and Steve Daniel. After a great dinner including a cold seafood platter, the wonderful Hugo's salad, and ahi tuna, I had the honor of paying Un's share of the tip. This was the result of the bad beat of the Pittsburgh Penguins (barely) making the playoffs. Un and I have a standing bet. I say the Penguins will go deeper into the playoffs than the Blackhawks. If either team does not make the playoffs then there is no bet. If both teams get into the playoffs then the bet is on and if the winning team also wins the Stanley Cup the payoff is a high end dinner in Las Vegas during BARGE. When the Penguins barely made it to the playoffs I immediately contacted Un and asked if I could buy out my bet...and he was gracious enough to agree. After dinner I went down to Walgreens for supplies and then visited Binion's to say hello to folks in the tournament that evening. A few years ago I tried a 7pm tournament and found that due to jet lag I was barely able to keep my eyes open by the time we had gone a few levels. I realized that there is no point in playing in a tournament that I have no way enjoying it...much less winning it. So after a while I went and played some video poker and then off to the room and bed. By the time we were done it was nearly time for the board/organizers lunch that, as an emeritus member of the board, I had been invited to at Triple George. Obviously I was not that hungry, but I did manage to eat a virgin Cobb salad (no chicken). I didn't play a hand beyond Razzdugi (13) but I had a ball playing and hope that this tournament becomes a fixture at future BARGEs. In early BARGEs a group of mostly cigar smokers would get together in a private room at a high-end restaurant for dinner and cigars. Over the years, various people (such as myself) who didn't smoke but who enjoyed the food and company started to attend. When Vegas restaurants stopped allowing smoking the tradition continued (except for the smoking part of course). In recent years the dinner was organized by Goldie but since he was also a BARGE organizer this year he did not have time. Instead he scheduled a more informal non-smoker at Pizza Rock at 6:30pm. The time was choosen to coincide with the break in the 25-game tournament. That break turned out to be scheduled at 8:30, but nevertheless at about 6:15pm five of us (myself, Dan Nussbaum, Andy Bloch, Goldie, and Crunch) headed over to start the festivities. The folks at Pizza Rock were skeptical that a large group would be following us, so they seated us at a 6-top table and we placed an order. Shortly later, after our drinks had arrive, but before our food, they moved us to their more private room as many others had started to arrive. We eventually totaled over 30 people spread across three long tables. The pizza, especially the Sausage and Stout pizza, was terrific. We paid by table and at our table the cost including drinks and tips was $28 a person. Wednesday is traditionally the day of the Egg & I breakfast. This started a fair number of years ago when Steve Eisenstein suggested that everyone meet there at 8:30 in the morning and then surprised everyone by picking up the bill (except for tip). Several years later Goldie joined him in paying and after that I did as well. We met JZK at the Golden Gate (where he was staying in what he says was a luxurious suite) and drove to the restaurant. It was already full of BARGERs. This year we had about 52 people...in other years its been as high as in the high 60s. The video poker tournament was next and I learned that my fingers are getting nearly as sticky as the keys on a Binion's video poker machine. It actually came close to hurting to play. Again I did not place, but that was pretty much assured by someone (Doug Grismore?) being at over 3,000 points within the first minutes of the tournament. Finally there was the craps tournament. Last year I also placed in this tournament. This year I was in the number 10 position at my table, with no one to my left and Jordan Devenport in the 1 position. I got the button but since I am as likely to hit another player as the end of the table when I throw, I passed to Jordan...who placed his entire stack (except the one required pass line bet) on the field and proceeded to roll a 12. For those of you who don't play craps, the field bet is not a good bet. It is a one roll bet that pays even money if a 3, 4, 9, 10, or 11 are rolled, double on a 2 and .... triple on a 12! First place for the tournament was pretty much locked up right there on the first roll and I did nothing to distinguish myself from the rest of the players. By the time all of this silliness was over it was time for an early dinner so that those playing in the HORSE tournament could be back in time for the 7:30pm start. Earlier I had asked Patti and Ice if they wanted to have dinner that evening, and we ended up at Joe Vicari's Andiamo Italian Steakhouse at the D. The three of us were joined by Goldie, JZK, and Tiltmom. Patti and I split some steak tartare and we almost all had the table-side prepared Caesar salad. Goldie and I split a crispy fish whose name I don't remember but it was delicious, as were the grilled asparagus, the lobster ziti, etc. At some point during the dinner Kim had disappeared and we found out later that she had given the Maitre D her credit card to cover the meal so that there would be no arguing over the check. Of course a great argument ensued, but Kim (or should I say the rest of us?) won. Those who were playing in the tournament got back nearly in time for the first hand. Goldie was heading to the smoker at the Goldman's. I decided to try my hand at some NSUD Deuces Wild video poker. I did not do nearly as well as Foldem who had managed four deuces twice in as many days. In fact I helped the D fund his wins (very slightly). Then it was off to Binion's where Allknight and I talked about the Pirates and then the two of us went off to Leppert's at the California for some ice cream. Before bed I played some video poker at Binion's and won some money. Thursday was CHORSE. I had planned to pick up a donut at Dupars but when I got there they were out (even though it was 9am). I had pretty much decided to skip breakfast when I ran into Deron Brod coming out of Binion's and he invited me to join him and others at Magnolias. It turns out that I had run into a strategy meeting for a competing CHORSE team consisting of David and Caryl Aronson, Deron, David Soussan, Gillian Groves (? ), and Janie MacIntosh. Not much strategy discussion ensued, and so I had no inside scoop to give to my team, the McLibtards. After CHORSE came the annual group pilgrimage to I Love Sushi in Henderson for some good old fashion hamburgers. (I bet you thought it was going to be for Sushi.) I rode out with the Aronsons, Jordan, and Kenny Shei. The was a crowd of 26 of us (plus Kai Landrum) dining on as much Sushi as we could eat...fancy dishes with names like "your sisters mustache" or something like that. All very delicious. One of the traditions of this meal is that someone makes an educated guess as to what the per-person price will be (called setting the line) and everyone who cares bets $5 on whether the actual price will be over or under the line. I was sitting next to Chuck Humphrey who said to me that he expected that the line would be set at around $43 (I forget the exact numbers here). I bet him $1 that it would be under. This was sort of a meta-over-under bet and it later cracked up people who heard about it. Anyway, the actual line was set at around $41 and both Chuck and I took the over (in prior years I had almost always taken and won with the under). The actual bill per person was about $43 so not only did we both win, but Chuck's line would have been much better than the one set by Un. At 9pm Nolan, myself, Goldie, and Bruce Kramer sat down at a table for about 30 at Bazaar Meat. We were the only ones at the table. We were soon joined by Ben and Asya who were there for their second visit in a week. Their addition to the table probably increased the number of diners in the entire restaurant by at least 2%. It was a huge empty room full of wonderful smells and lots of staff and the food was excellent (or maybe beyond excellent...not sure of my superlatives here). Some of us started with the Cotton Candy Foie Gras, there was made-at-the-table steak tartare, a carpaccio platter, a sausage platter, bouchon potatoes, a whole roasted chicken, a 2.25 lb washugyu ribeye and more that I am forgetting. Everything was wonderful, but the chicken may have been the best chicken I have ever had. Friday started with breakfast with Bozo, Frank Irwin, and Goldie. We ended up having it at the Golden Nugget just for expediency. Bozo and I had started having breakfast on BARGE Friday when he began to come to BARGE after a several year absence. Frank, who was a present-at-the-creation BARGER had been away even longer, joined us this year. We used to get together at the WSOP back in the days when my site, ConJelCo, was handing the Internet coverage of the events. One memorable year the two of them took me for dinner on my birthday to an extremely good Mexican restaurant out on Desert Inn if I remember correctly (none of us can remember the name of the place.) In any event, it was great to catch up after a number of years. Even better...after Goldie offered to pay for breakfast, Frank would not hear of it. So we suggested CCR, which Frank had also not heard of. Bozo won the privilege of buying all of us breakfast. The tournament Friday morning was the Mike Sexton TOC-style tournament. I did not play particularly well or badly, but my major good play was getting up from the table about 5 minutes before the clock ran out prior to the break to run to the deli to order a brisket sandwich to be picked up in a few minutes. This put me at the head of the line when the break actually game. I busted out of the actual tournament about 45 minutes after the break ended. I have no memory of how. By then it was almost time for the Symposium. We had put together a smallish syndicate of seven people to bid on players and bought perhaps a ten pairs. Whether or not we would make money on these purchases would be determined by how the members of the pairs did in the main event on Saturday. I received a text from a friend, Joe Tall, who asked if I was going to be around. I told him my schedule, which at that point was basically up in the air and he said he'd be down about 6:45pm. In the meantime, Edmund Hack, another original BARGEr had asked if I wanted to get a bite to eat. We eventually decided to ask Joe, Frank, and Bozo to join us at Pizza Rock for a quick slice or two. There was a longish wait there so I put my name on the list and they said that they would text me when a table was ready and that we'd have about 15 minutes to claim the table once they did. They predicted over an hour wait but it only ended up being about 45 minutes. When Joe showed up he gave me a great gift. He had once worked for a railroad in Maine and had a small collection of three switch keys one of which was perhaps 80 years old, that he said had been waiting for someone who would appreciate them. I was going to use them as a card protector in the NLHE tournament but decided that there was too much risk that I would forget them. Then it was off to Karaoke. I was so tired at this point that I did not feel the urge to actively participate in spite of Sharon coming up to me and asking if we could so our usual "Paradise Under the Dashboard Light" duet. I did participate in the open bar (thanks Dan!) I was very moved by Un's Spirit of BARGE rendition and shared a private moment with Foldem who was my co-organizer of BARGE for oh so many years. The big day. Again I had not intended to have breakfast because David and Chris Kluchman were providing Oface donuts for everyone at the tournament in honor of Chris's birthday. But at about 9am (the tournament started at 10:30) I received a text from Bruce Kramer saying that a group was having breakfast at Dupars and were at that point waiting in line. I arrived just as they were being seated. The table initially included Bruce, and Barry Kornspan, and Sharon Lewis, and at least one person I am forgetting. We were soon joined by Jared and Carol Anderson. Luckily Bruce discovered the smaller portions on the back of the menu so that I didn't have to try to ingest four whole slices of french toast. We got to the tournament in plenty of time. As I sat down I noticed that Eileen Milligan was the dealer at our table. She told me (and others) to go get a rose from behind the podium and give it to Chris Kluchman for her birthday. Sure enough there were many dozens of roses of varying colors behind the podium and I selected one for Chris. I got a hug from her in return. Happy Birthday Chris! I played at a table with David and Brian O'Grady, Stan Wood, Joe Long, Andreas Wolfram, I think Oscar was at the table as well, but I am drawing some blanks at the moment. Pretty much like the hands I was dealt. I eventually went out by going all in against Brian O'Grady with my QQ not holding up to his, I believe AJs. As the tournament began, I had a creme fraiche Oface donut thanks to the Kluchmans. I'm afraid to say that it reminded me of a not-hot Krispy Kreme donut. I should have gone for the lemon custard. After a brief bout of depression, Heldar and I went over to Main Street Station in search of some reasonable paying video poker. I had consulted the vpfree2 site and knew what I was looking for. Unfortunately we went counter clockwise around the casino and it wasn't until we were more or less back where we started until we found the "good" machines. Rick and Polly Mombourquette and a few others wandered by while we were playing and we were eventually joined by Paul Stine. None of us did particularly well on those machines but we enjoyed each others company and conversation. At the banquet Mike Chow and I sat at a table and held seats for Josh Paley, JZK and Aston, and Ice and Patti all of whom soon joined us. For once the food at the banquet was very good...my prime rib as done just right and the asparagus were a bit crunch the way I like them. I did not need or eat the dessert. The speaker was Jen Shahade, a chess champion and poker professional who had a great presentation of what I would call avant-garde poker and chess films if I knew what avant-garde meant. (My 19 year old daughter, Lizzy, is getting into film at the Pittsburgh Film Makers and I texted her a link to Jen's films to perhaps inspire her.) Jen is a very impressive lady who went on to be both the first BARGE speaker and first woman to win the BARGE NLHE event. I'm sure the prize pool was a pittance to her but she seemed to completely get the spirit of BARGE (playing in at lest three of our tournaments) and I am hopeful that winning meant something special to her. In fact there were three women at the final table and I believe all three of them lasted until the final six. Sharon came in sixth, Bree second, and Jen first. Unfortunately of those who were paid in the tournament, our syndicate only had 15th, 12th, and 11th...not enough to compensate us for what we had paid for our "horses". As soon as I collected the returns to our syndicate, I went around and distributed them to our members...then off to bed around midnight for an early wakeup call the next morning. Paul McMullin picked me up at the GN valet entrance at 7:15am and we drove by (and returned to) the rental car center. We both had TSA pre-check, but I found that there wasn't a pre-check aisle at the entrance to the B gates. Since I did not want to take off my sandals and walk barefooted through security, I hiked over to the C gates and even so was at my gate by around 8:15am for my 9:40am flight. In spite of doing early bird checkin, I received boarding pass A60. Glad I didn't wait until 24 hours prior. The flight was going to be full, so I took the first aisle seat where the other two seats were occupied by "small" people and where there was overhead space for my luggage. This proved to be around row 8. I chose the flight because it was nonstop to Pittsburgh and tail winds had us arriving about 25 minutes early. I had hoped to talk Barb into picking me up at the airport but one of our puppies had puppy surgery on Friday and Barb did not want to leave her. But I made it to the curb in time to catch a PAT bus back to Pittsburgh and Barb picked me up and I was home by around 6pm Pittsburgh time having just experienced the best BARGE evah! My thanks to the very able organizers of BARGE 2015, Russ, Goldie, Jeff, and Rich and to the board of directors, Un, Becca, Heldar, Barry and David. I am privileged to know all of you as well as the rest of the attendees of BARGE. I can't wait to see what the next year brings us for BARGE 2016.